This morning was our first "blended" service at Hill's Chapel. The 9:00 contemporary service and the 11:00 traditional service have been collapsed into one 10:00 worship hour for the summer. 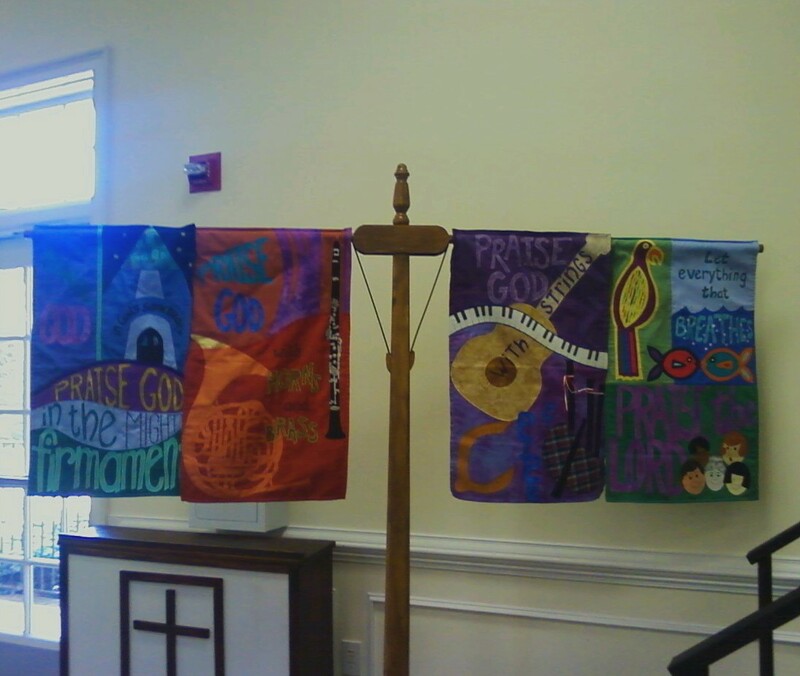 I thought things went really well--we opened with 3 contemporary songs ("Forever," "Blessed Be Your Name" and "Sanctuary"), had 2 special songs (more on those in a minute) and also sang 2 hymns ("My Hope Is Built" and "It Is Well"). 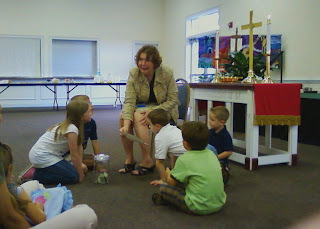 Here's a picture of Val giving the children's message--they blew out a birthday candle and made a wish for the church (in reference to Pentecost, the birthday of the church, which was last Sunday), then Val told them about the young girl, Genese, a Haitian girl whom HCUMC is sponsoring through World of God. They then lit another candle and made a wish for Genese. That is a wonderful message of hope and encouragement. However, Val actually turned this passage on its head somewhat, because although those words are true, when taken a certain way they can actually create harmful attitudes. If we aren't careful, we run the risk of saying that suffering is a gift from God to make us stronger--but God does not want his children to suffer any more than a human parents wants his or her son or daughter to suffer. And God does not inflict pain or evil upon us to test our faith or to make us better Christians. Bad things happen because we are broken people living in a broken world, and sometimes trials come and seem to have no redemptive qualities or life lessons, and to reduce them to such is to trivialize the issue. Our two special songs today set up this message. The first one was "Held" by Natalie Grant, which I played. This deeply moving song was written after a friend of hers lost her 2-month-old baby. I've sung this song before and I absolutely love it because it looks suffering right in the eye and refuses to rationalize or justify it. The anguished cries of the bereft--"to think that providence would take a child from his mother while she prays is appalling"--are painfully real, and the chorus does not try to take the confusion and anger away. Natalie sings, "the promise was, when everything fell, we'd be held." God does not promise to make everything better or to reveal some divine purpose for unimaginable tragedies; he promises to hold us in our hurt. Haas writes fantastically beautiful melodies. "Blest Are They" is another favorite of mine, a musical setting of the Beatitudes. Between those two songs and the opening praise tunes, I think the service set up the Scripture reading and Val's sermon very well. And of course, "My Hope Is Built" reinforced the theme--"When all around my soul gives way, he then is all my hope and stay"--as did "It Is Well"--"Whatever my lot, thou hast taught me to say, 'It is well, it is well with my soul.'" On a completely unrelated and much lighter note, I brought my two pet mice back from Charlotte with me this weekend. Here's a funny video of Lilly the Yorkie meeting Abby and Mrs. Jingles (sort of). "You shall love the alien as yourself"